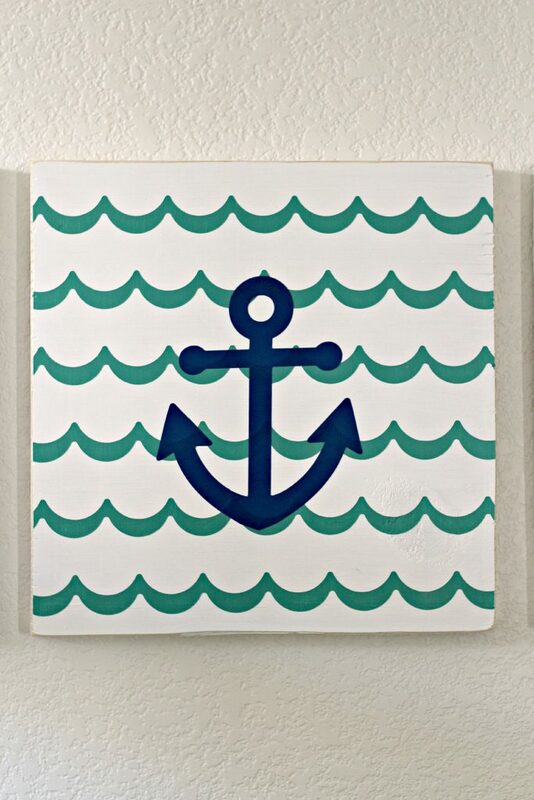 Easy to make customized Bathroom Wall Art using scrap wood and shape tape. My kids don’t have an issue with blank walls but I sure do. I don’t mind a little white space but since we’re renting everything seems to be white and blah. 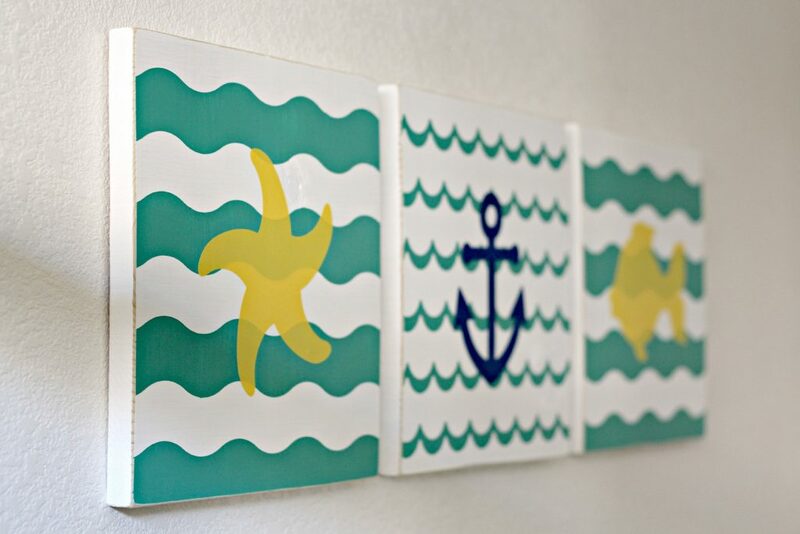 Making our own art for their bathroom is an easy way to add color to the room. White walls, white tile, glass shower door, and a huge mirror doesn’t leave much space to add color so it was time to go bold! It was easy to come up with 3 fun pieces of art for a minimal cost using these few supplies. Use my ideas or be creative and come up with your own. 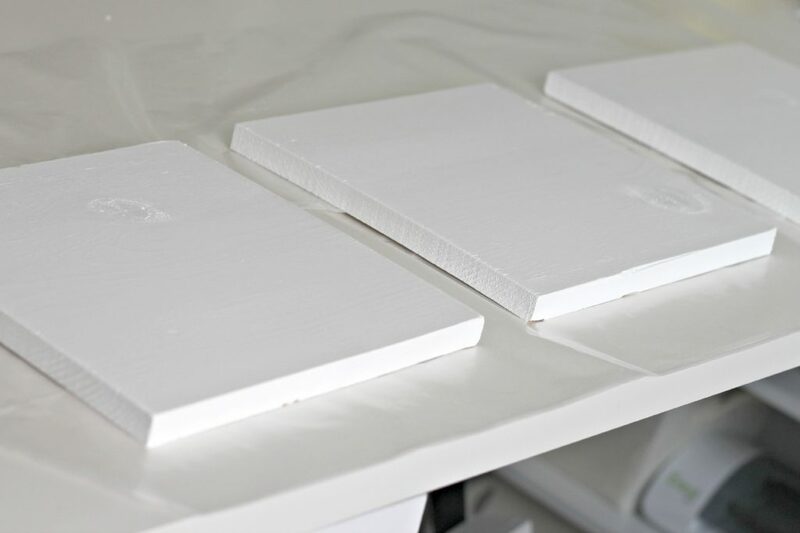 Start by painting the 3 pieces of wood using 2 coats of white paint. Let them dry over night or for a day before adding the next color. I love shape tape! It would be impossible for me to make these shapes without it. The guide marks on the front of the tape are so helpful. The slit liner on the back of the tape makes it easy to apply by removing one half of the liner, positioning the tape and then removing the other half. 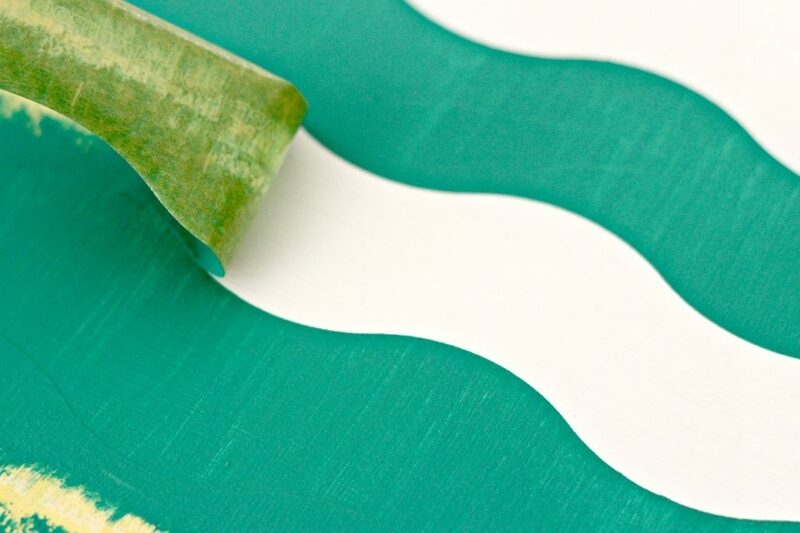 You can create the pattern you want by varying the widths, reversing, or staggering the tape to make your own unique designs. 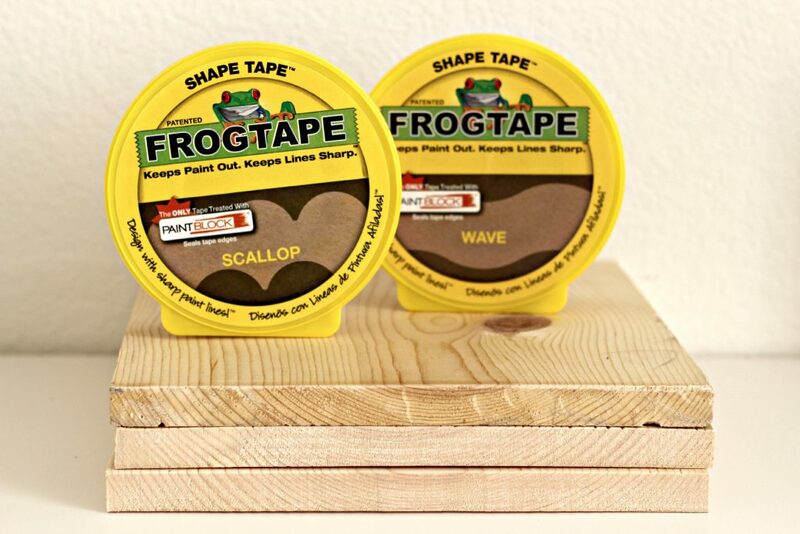 The tape comes in 3 different shapes so you can pick your favorite for you particular project. 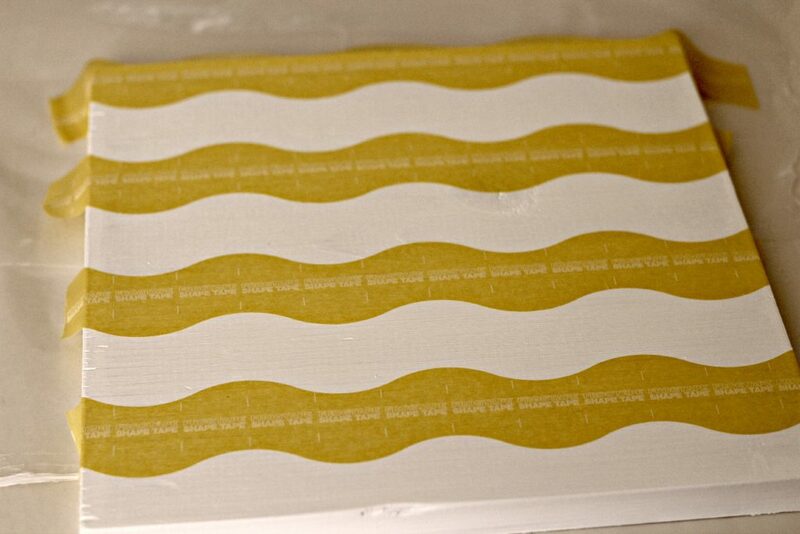 I’m working with the wave and scallop tape for this project but there is also a chevron shape tape. I applied 2 coats of Ultramarine. 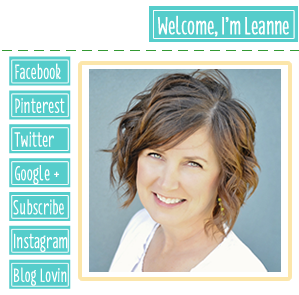 I love this bright color and it’s pretty perfect for that sunshine and coastal feel. Let it dry about 10 minutes then peel the tape off. Do you love a crisp clean paint line as much as I do? It’s so fun peeling off the tape for the big reveal. TaDa! I love how they turned out but they still needed something more before hanging on the wall. I distressed the edges a little using medium grit sandpaper. I decided not to distress the top for this project, but that would look really great and it’s a good idea for my next project. I used a personal cutting machine to cut an anchor, sea star, and fish out of vinyl. You could actually cut them out by hand because they’re such a simple shapes. 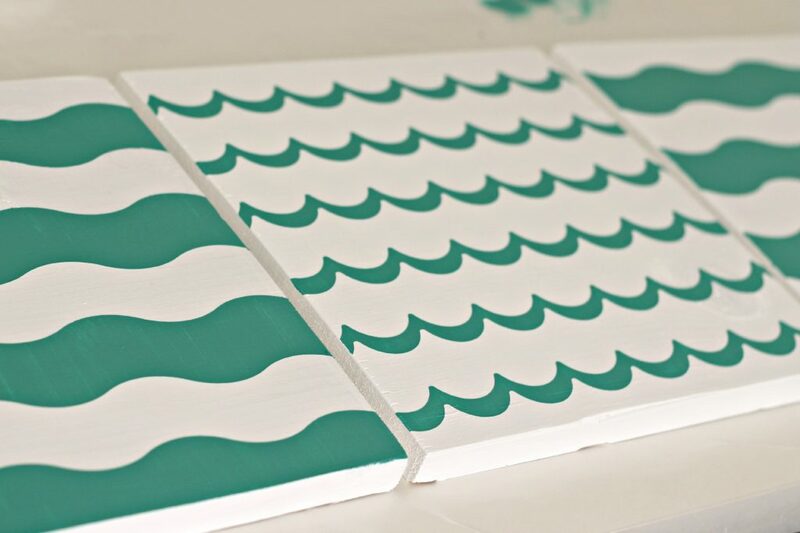 Or use them as stencils and paint the shapes on. 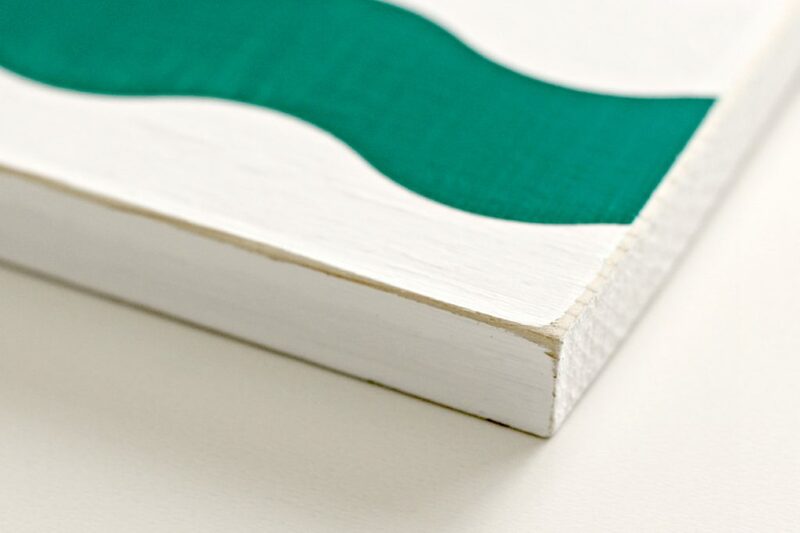 Once the paint is dry apply the vinyl to the front of each piece of painted wood. I love the color the pieces add to the bathroom and that it’s so easy to make custom pieces using a few simple supplies. Our homes should reflect our family’s personalities and interests and custom pieces can do that. I would use it for my kitchen wall that needs a little something extra. 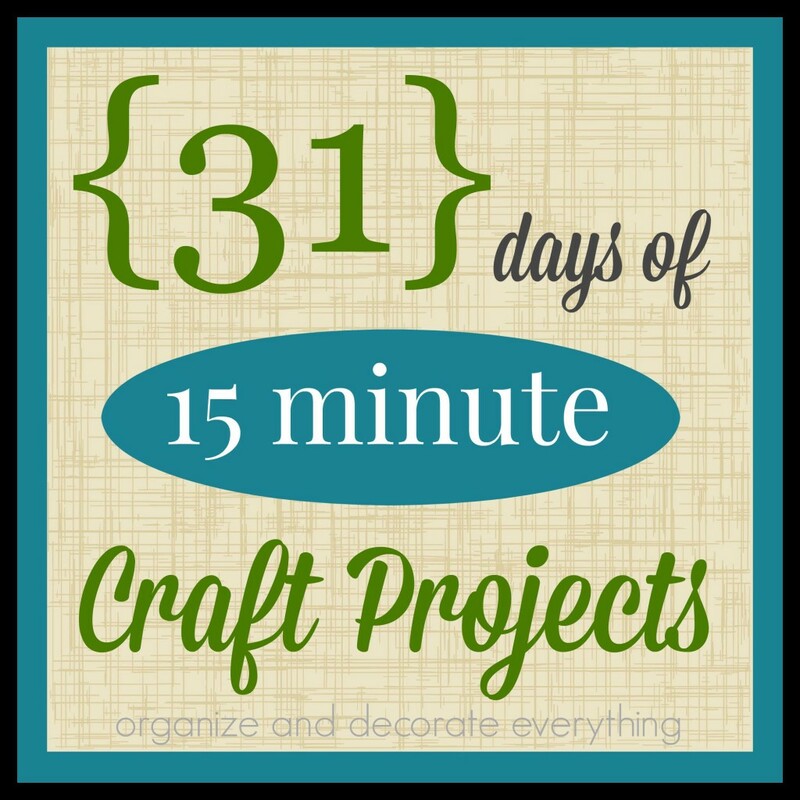 I would use it on the sides of my craft cabinets in my craft room. They are plain white and this would make a great impact. Ooh, that’s really cool. No more hand-drawing or trying to find the right size stencil. I think my first project would be some new art for my daughter’s room. She’s almost ready for her ‘teen room’ makeover. In my son’s bedroom! It needs a make over. So Cute! I love this idea! I’m planning on redoing my kitchen soon and this totally gives me new ideas. Oh that tape is awesome! I can just imagine so many possibilites! Two projects actually. First would be your idea for the bathroom – that would be perfect. Then she is a children’s librarian and that frog tape could be used for summer reading projects. Oh the possibilities! I have been looking and wanting to buy some for a while now! I want to use it mainly to make a sign for my kitchen – also would like to try and to a no-sew pillow cover using it – also would like to try and stencil with it on some mason jars for my daughter’s upcoming birthday party 🙂 thanks! 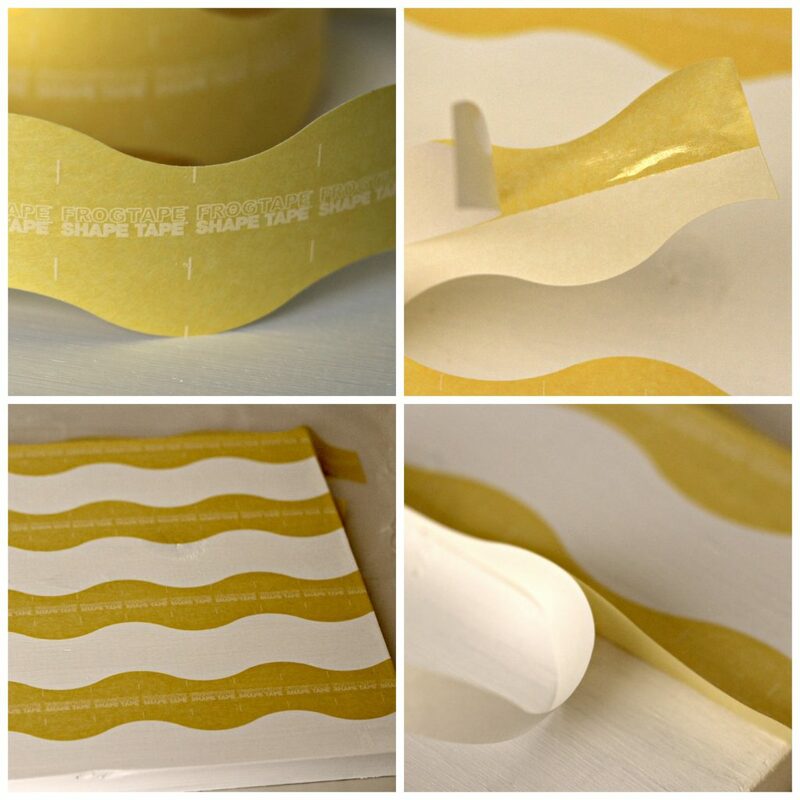 How clever is that Shape Tape!! I would make some creative wall art… following your great inspiration!! that need something more would be a good place to start. I love Shape Tape! I own the Chevron, but, I want the scallops like you had!!! I would use it on my daughter’s plain dresser to jazz it up! ADORABLE, I love the colors you used!! 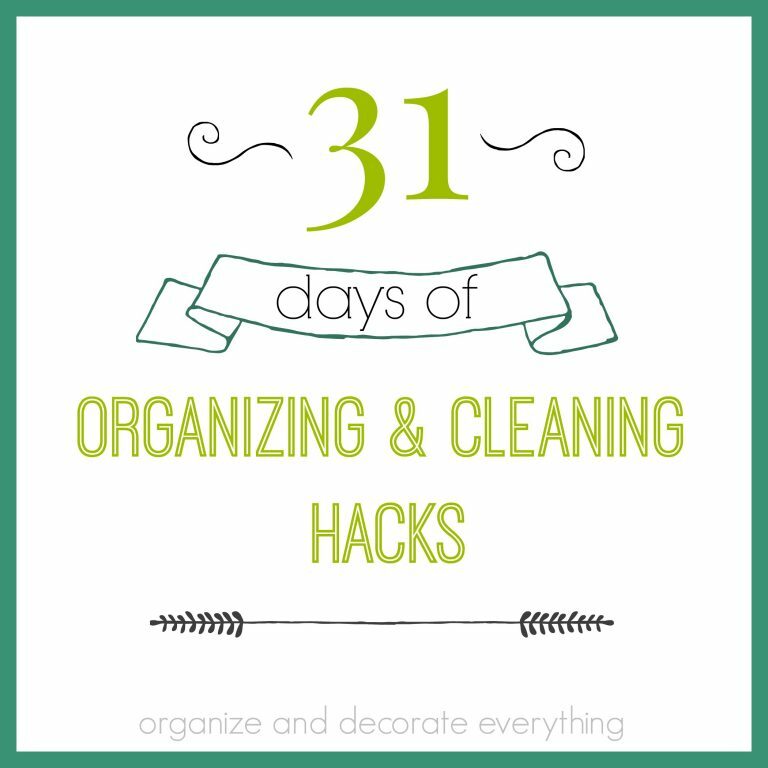 I am currently redoing my office and the little plaques in this post would be a cute addition. 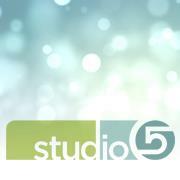 Furniture redos and sign painting! Thanks for the chance to win! That tape looks so cool! My craft room needs some dressing up! The timing for this post is perfect. We just finished our kids’ bathroom and I have been trying to decide what to put in there. This is a perfect idea! 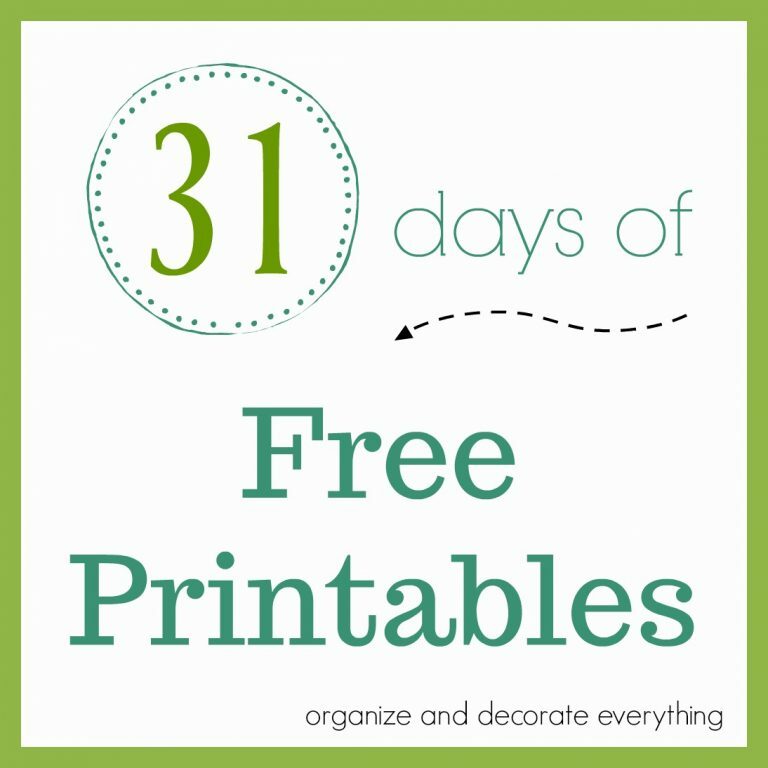 I’d use Frog Tape to paint a fun design on an old dresser that needs sprucing up! These are so stinkin’ cute. I love nautical anything! I absolutely love that scallop! So fun. My brain is swimming with all of the ways I could use it! kimber recently posted..Best Gift Ideas for a 2 Year Old Girl! I love the chevron and would love to use it on a piece of furniture! I need some wall art for my bathroom–this would be the perfect start! It would be cool to use on some frames for my son’s room re-do! I would use Frog Tape for an art project for my bathroom and one for my bedroom – just painted and needs those finishing touches. Thanks for the chance to win this fun product ! We recently remodeled our kitchen and I’m still trying to come up with something to put on my kitchen walls, so I’d love to have this to use for whatever I come up with. We are currently decorating my little guys room. I’d love to use it to help create a large wall art. I LOVE your signs! They are so fun. That tape would be so fun to play with . I’m not sure yet what I would make if I won, it would be fun tho! Love this! 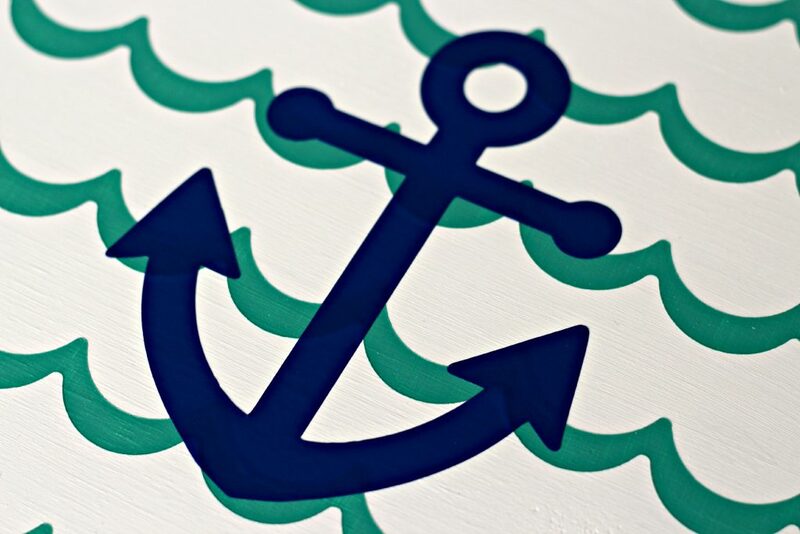 I have some painting I need to do in our new house, I love the idea of a scallop design on my daughters dresser! 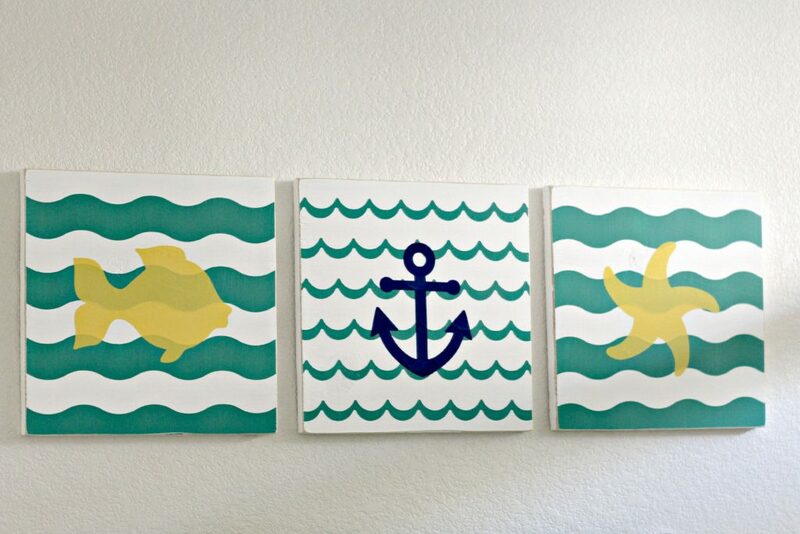 I’d love to make some art for my girls’ bathroom… that wave tape is too cute! I’d use it to pain my son’s nursery! 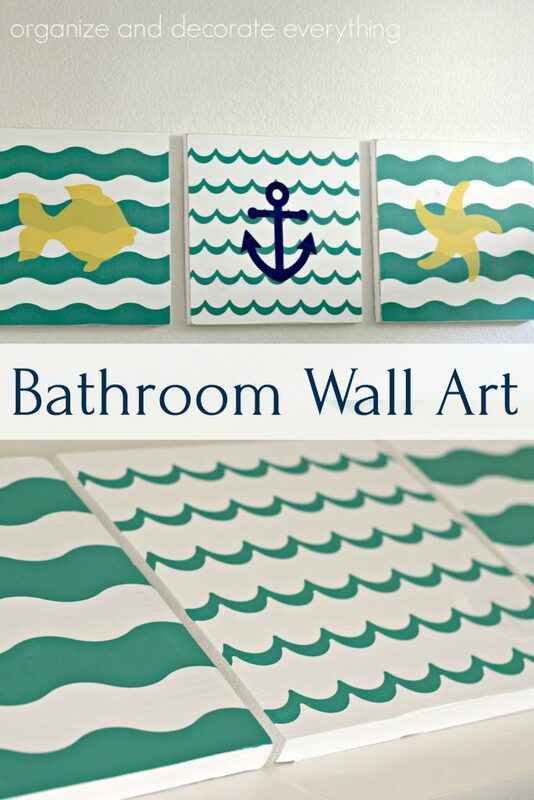 I would use this to make a fun wall art for the bathroom that I cam remodeling! I could use this to make fun wall art for my granddaughter’s nursery! Is this open worldwide? (I live in Europe) If yes, I would definitely use it for my parents’ bathroom that needs a little “umpf” in its life 🙂 Thanks! I want to paint the dresser I had as a child – for my own child. I would use it for art projects around the house! I would use them for decorations in my daughters room! What a great idea! I would love to give these examples a try for my bathroom! I am painting a lot of old, dark stained pieces of furniture & would love to use the shape tape to give some of the pieces a bit of design other that having everything just solid colors. I had never heard of this tape before. Thanks for sharing! What a bright and cheery design idea. I hate large blank white spaces as much as you do! Paint makes such a huge difference! I love the blue and white together, and the idea is just awesome. So lovely & innovative. Keep going. Scallop design is awesome. We’re going to decorate our bathroom next week! My kids will love that.